If you're not aware, April is Alcohol Awareness Month. Rather than focus on my own issues with alcohol, as I've done in many posts before this, I wanted to take time to examine the so-called sober-curious movement -- something that isn't entirely new, but has gained popularity in recent months due to several news publications and the aptly titled book "Sober Curious: The Blissful Sleep, Greater Focus, Limitless Presence, and Deep Connection Awaiting Us All on the Other Side of Alcohol." To choose to question, or get curious about every impulse, invitation and expectation to drink versus mindlessly going along with the dominant drinking culture. What this means is that rather than jump head-first into the prevalence and assumption of drinking at events, parties, dates, hanging out, etc., taking the time to step back and ask yourself "why" can actually be extremely enlightening in your own wellness journey. With the increased number of people taking the time to focus on their own well-being and health in general, the number of those becoming sober-curious has increased as well. Changing aspects of your life for the better, such as increasing exercise and improving the foods you eat seems to clash with what commonly went unquestioned: blackouts, hangovers, and excessive social drinking. People are realizing that the trade-off for alcohol consumption may not be worth it in the long run and are taking a step back to reassess their relationship with the drink. Sober-curious differentiates itself from being completely sober in that there's still the option to drink. Obviously, if someone considers themselves an alcoholic or has a dependence on alcohol, this choice is not appropriate. While I'm not completely on board with the nomenclature, the movement itself is, for me, a step in the right direction. The term "sober-curious" carries the implication that "not sober" is the default way to live and that we are only now becoming aware of another, alcohol-free way. Had you asked me about it nine years ago when I was still drinking, I would have laughed at the prospect, but today it's something that I've often pondered as I listen to stories of hangovers and embarrassments from those that I know. Before recovery (and putting the self-medicating aside), I would have told you that the real question is "why wouldn't you drink?" It's fun, it's emboldening, and it's just assumed that that's what you do. It wasn't until I stopped drinking (sober, not sober-curious for this mess of an alcoholic), that I began looking around and realizing that the reason many people around me drank didn't really have anything to do with those reasons above. I realized that people were stressed. People were sad. People would rather escape for a few hours than sit with those feelings. Drinking was often a crutch for people and events like weddings and birthdays were socially acceptable places to escape in excess. This is clearly not true of every person who drinks, but I fear that for a great majority it is. As adults living in an alcohol-fueled culture, why else would we decide to put ourselves through debilitating hangovers, unnecessary cost spend, and risk social embarrassment time and time again? It is far easier to ignore problems than it is to face and work through them. I can attest to this and sometimes it's the easier way that wins. The beautiful thing about being sober-curious is just that -- a curiosity. That means you are free to test things out at your own will and for as long or short as you like. It's far less daunting than completely abstaining from alcohol, especially when that abstinence is usually measured in lengths of time to be told to others as a sign of recovery. All it requires is that you pause before making the decision to drink. 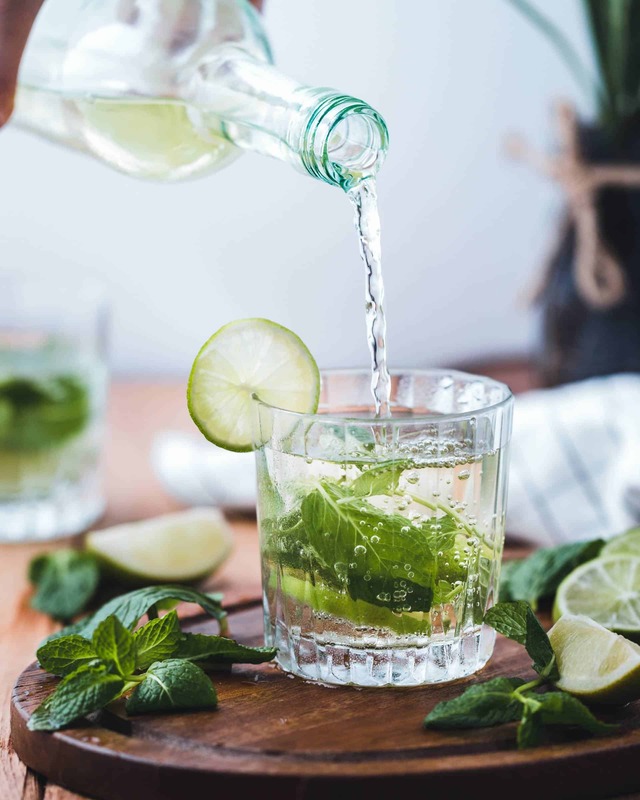 If you're out with friends, maybe start by drinking something non-alcoholic as you assess whether you feel like alcohol will actually add to the occasion. It doesn't mean that you have to never see your friends again or never go out for the night, it simply means that you're in control of your choice to drink or not. The moment I realized that I didn't HAVE to drink was life-changing. It seems like an obvious understanding, but I needed to be told that drinking was actually an option rather than an obligation for me to realize that I had a choice. Ask yourself if the trade-off between drinking and how you feel the next day is worth it. If it is, go for it. Decide on a time frame to abstain from drinking so that you can assess your relationship with it. That may be a week, a month, or more. As long as you don't have a clinical problem with alcohol, you can take what you've learned and decide how you want to proceed in terms of drinking. The sober-curious movement is not only eye-opening, it's empowering. YOU take control of your health and wellness. YOU make the decision not to fall back on drinking to escape. YOU decide how you want your life to operate and what does and doesn't fit. Sometimes all it takes is a little reminder that you are in control of yourself, your thoughts, and your actions. Remember -- you don't have to drink. Or you can. It's up to you. You write so eloquently! I have friends who have had problematic relationships with alcohol. Wish they could read this. Something that seems so obvious but so enlightening to hear. It’s interesting how the assumption is so often “why wouldn’t you drink?” I like the idea of starting with a non-alcoholic drink and assessing my choice from there. Thanks for sharing! Great post Erin!! I know too many people who constantly say they NEED a drink because they had a bad day or work is stressful. That actually has turned me off from alcohol and the fact that even drinks I have tried with a single sip I don’t like how the alcohol feels in my throat or even the feeling of being tipsy. I wish more people would take the time to think about why they drink. Your post described perfectly what I try to explain to my fiancé also I am going to have him read it too. I also want people to understand they don’t need to have a drink to have fun. I can think of many other activities to do to have fun.